Stem cells are special cells that have the ability to transform into other types of cells that form specific tissues or organs in our body. Stem cells have the power to regenerate and make more of its copies through cell division. Stem cells are of three primary types depending on their ability to differentiate into specific types of cells. Totipotent – a stem cell that can practically grow into a full human being. Pluripotent – a stem cell that can differentiate into literally 200+ different cell types. Multipotent – a stem cell that can differentiate into a limited number of cell types. Totipotent and pluripotent are stem cells of the early embryonic and fetus stage respectively. Multipotent stem cells are adult stem cells that live in different parts of our body and continuously regenerate and differentiate into specific cell types. This helps the body make up for the lost cells. There are over seven different types of adult stem cells. For instance, a Hematopoietic stem cell can differentiate into multiple different types of cells in our blood. A Mesenchymal stem cell found in the bone marrow stroma is known to differentiate into bone and cartilage tissue, and fat cells. Depending on the type of stem cell used, a stem cell therapy can be of an embryonic type or an adult stem cell therapy. Embryonic type uses the pluripotent stem cells that were originally extracted from an embryo, while adult stem cell therapy depends on extracting the adult stem cells from the patient’s body or that of a donor. There’s also a third type called induced pluripotent stem cells (iPS) in which normal cells are induced to behave like embryonic stem cells through DNA manipulation. Osteoarthritis is a degenerative disease that affects mostly the cartilage, a tissue which helps the joint to move smoothly. In later stages, the disease also affects the adjoining bone surfaces resulting in severe pain and lack of mobility. The condition is irreversible in nature because unlike many other body tissues; cartilage tissue lacks the natural ability to regrow and repair itself. Stem Cell therapy is a novel approach that attempts to overcome the regrowth and repair challenge presented by the disease. The primary objective of the stem cell therapy is to help the body regrow some of the lost cartilage that acts as a cushion between the bone joints. While there are a few variants of stem cell therapy, the one that is practiced for osteoarthritis involves the siphoning off of special types of stem cells called the Mesenchymal cells from the person’s body, either from the bone marrow or extracted from the body fat that contains these cells. Following extraction, these cells are grown further in a laboratory environment and subsequently injected into the knee joint, along with other growth compounds or factors. A successful therapy outcome would involve the growth of new cartilage tissue at the site of the affected knee. These stem cells may also help regrow the joint linings that have become damaged due to inflammation. Another approach involves the usage of Mesenchymal stem cells derived from the human umbilical cord tissue. Proper safety precautions such as screening of the mother for infectious diseases and screening of medical history are exercised in this approach. The stem cells derived in this way are called allogeneic MSCs. A variant of stem cell therapy also exists that involves making a passage for the naturally residing stem cells in the person’s bone marrow to the affected joint area. 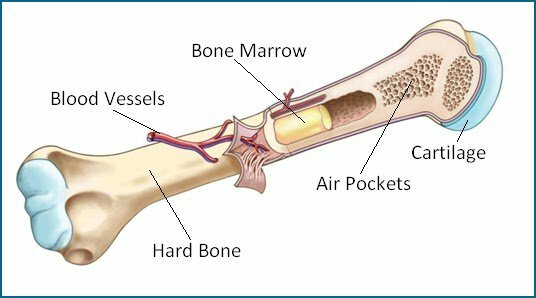 This passage is achieved by literally drilling a hole into the bone marrow area of the femur bone, thereby allowing the secretion of bone marrow fluids into the joint area. Similar to the direct stem cell therapy approach described above, this approach also enables stem cells to become available in the affected joint, to help heal the damaged cartilage through a natural re-growth. Such approaches have been used in addressing minor tears in the articular cartilage as a result of trauma or sports injuries. Common issues associated with usage of stem cell therapy relate to concerns about uncontrolled proliferation and differentiation of stem cells into types that are not desirable. A possibility exists with regards to the formation of tumors through such uncontrolled growth. Another issue is about the use of embryonic stem cells which are a foreign body and may invite the body’s immune response, which can make the therapy ineffective and trigger other harmful conditions. The third type of safety issue emanates from the usage of stem cells from a donor who is suffering from any illness. When person’s MSC cells are used, concerns related to immune responses or contracting any other disease are mostly taken care of. Even in the case of stem cells derived from the umbilical cord, a randomized controlled study performed on 55 patients did not find any clinical safety issues. However, because stem cells have the inherent capability to proliferate and differentiate into many different types of cells, more clinical trials need to be conducted to rule out the above safety issues associated with stem cell therapies. Does Stem Cell Therapy Help? The primary benefits claimed for the approach involve using a natural way to regenerate the lost cartilage by utilizing the stem cells that have the ability to differentiate into multiple different types of cells. A study published in the Journal of Bone and Joint Surgery cites that patients who received injections of allogeneic MSC cells (from a donor) along with partial meniscectomy procedure benefited with increased meniscal volume assessed through a quantitative MRI. They also reported a significant reduction in pain compared with the control group, which received only hyaluronic acid instead of the MSC’s. However, for all practical purposes, stem cell therapy is a treatment that is still in its early and experimental stages. Both in-vitro and in-vivo studies find that the quality of the cartilage generated through stem cell therapy lack the original articular cartilage in rigidity and strength, and is unable to sustain the same level of stress a normal cartilage tissue can bear. It is also for this reason that stem cell therapy is not advised in individuals who are suffering from excess weight, and therefore have excess stress in their joints. Further, stem cell therapy may not provide any relief when the extent of damage to the cartilage and associated bone surfaces has already exceeded beyond the early stages. What’s the promise that the stem cell therapy has for Osteoarthritis and Orthopedics? Is it something that is just on the horizon or still many years or decades away, as can usually be the case with any new technology? What risks does it carry? Stem cell therapy in today’s context is a procedure which has shown some promise when the person is suffering from early-stage arthritis. It may also help as an add-on procedure after a corrective surgery such as meniscectomy to promote better and faster healing. Interest in evaluating what stem cell therapy has in store for Orthopedics diseases such as osteoarthritis has been a hot topic for many years now. In 2008, Genzyme, a biotechnology company in the United States announced its plan to invest USD 1.4 Billion Dollar for two stem cell therapies. One of these two was for regenerating the lost cartilage in knee joints and aptly named Chondrogen. A large chunk of this investment was for funding the Phase III and Phase IV trials that are needed to get an FDA approval for treatment. Genzyme isn’t the only company that has pumped in so much into stem cell therapy. A research paper published in 2015 states that while the majority of clinical papers have shown promising results, most lack the high-evidence level that is expected for treatment to become a sure thing. Typically, the way a treatment becomes mainstream is when it receives FDA approval as a result of a large-scale, randomized, double-blind and controlled study that indicates a clear benefit of using the treatment approach against a placebo. Clinical significance of the stem cell therapy as compared to other treatment options, as well as optimization of the procedure regarding cell type and delivery method is still very much in experimental stages. The benefits vis-à-vis the costs still don’t indicate that the procedure is anywhere close to becoming a mainstream treatment approach. In conclusion, it is too early to say if stem cell therapy can become a magic treatment to reverse the damage caused by arthritis, thereby making other procedures like joint replacement a history. General, Osteoarthritis Bone and Joint Surgery, osteoarthritis, Stem cell, stem cell therapy. permalink.